Above: File photo of a Car2Go in 2013. Popular car-sharing service Car2Go wants to scale back its Twin Cities service area, potentially leaving parts of Minneapolis and St. Paul in the dark. The changes, which haven’t yet been publicly unveiled, would reduce the availability of the service for more than 22,000 people in the Twin Cities who use the blue and white Smart cars for short one-way trips. City officials have embraced such services, since they make it easier for residents to abandon their personal cars. The potential rollback taps into larger tensions between the economics of new shared transportation services like Uber, Car2Go and Nice Ride, which perform best in denser urban areas, and City Hall goals of reducing racial disparities around the city. Car2Go cars can now be parked anywhere in either city. Some Minneapolis areas possibly on the chopping block include much of the North Side and areas south of 50th Street, where usage is less prevalent, council members briefed privately on the changes said Tuesday. The company confirmed they were analyzing their service areas in Minneapolis and St. Paul, but declined to offer specifics since nothing is final. The reconfiguration would echo similar scale-backs Car2Go has made this summer in Columbus, Portland and Austin. During a committee discussion of car sharing Tuesday, city staff said they hope to ultimately implement some type of “border to border program,” ensuring cars are available throughout the city. One solution Car2Go has tried in other cities establishes reserved hot spot spaces outside the primary service area. Minneapolis leaders also said Tuesday that they will seek state law changes reducing the taxes levied on car sharing rides, which can reach 21 percent, largely due to state taxes traditionally geared toward long-term rental cars. “This is a huge cost barrier to people using these programs as an alternative to vehicle ownership,” said Council Member Linea Palmisano. After taxes, trips now cost about $.50 a minute. State Rep. Frank Hornstein, DFL-Minneapolis, said he would likely sponsor a bill carving an exemption for these types of businesses from the state’s rental car taxes. “The idea is to say, ‘Look, rental cars and Car2Go, they’re two different categories,’” Hornstein said. Owned by Smart car manufacturer Daimler, Car2Go has operated in Minneapolis since 2013 and St. Paul since 2014. It currently has 535 vehicles in the Twin Cities market. Users locate the cars using their smartphones and may leave them at any legal on-street parking spot without paying the meter. The vehicles tell users if they are parking outside the coverage area. The company initially paid the cities a flat fee for theoretical lost meter revenue (at least $1,600 per car annually in the case of Minneapolis) but now reimburses the cities based on how long each vehicle is actually parked at metered spaces. The latest data from the company (mapped below) shows that Minneapolis’ usage is most common in the greater Uptown area, while the fewest number of trips originated in North Side and southwest ZIP codes. 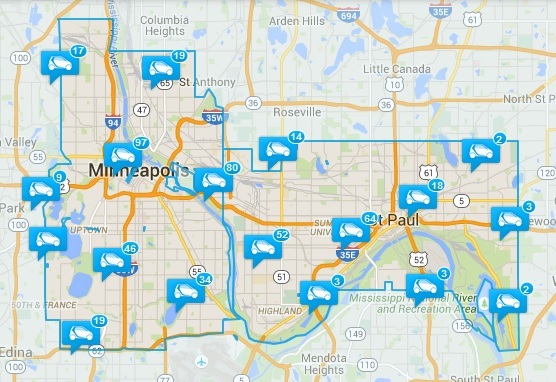 Above: Car2Go's current Twin Cities "home" or service area. Nice Ride, the Twin Cities’ five-year-old bike share operation, faces similar dilemmas about installing stations where ridership will be highest — generally not areas dominated by single-family homes. They have made an exception by placing several stations in less dense parts of the North Side, though unlike Car2Go, their capital costs receive taxpayer support from the federal government. A Minneapolis council panel voted Tuesday to extend into February a pilot program for Hourcar and Car2Go, allowing them to keep cars in on-street spots. Hourcar, which requires users to return cars to their original location, has more than 40 cars in Minneapolis — though most are located in private lots and ramps. Zipcar, which had also experimented with on-street spots, opted to revert to exclusively relying on off-street stalls. Car2Go’s proposed changes were alluded to, but not explicitly outlined, during Tuesday’s discussion. “This coverage citywide is really important,” said Council Member Cam Gordon. Council Member Lisa Bender added that there needs to be balance. She noted that car sharing has become crucial to many people in her Uptown area ward. “I wouldn’t want to see us limit, for example, a company from operating in the city at all if they aren’t able to reach the entire city — at least unless I had more information about how we could strike that balance,” said Bender, who has not seen the proposal. Bender later clarified on Twitter that there is a distinction between ensuring the services cover low-income areas and having them reach "everywhere."